The classical Christian claim is not the same thing as relativist courtesy. The text has a deeper meaning not because I infer it but because I discern it. The meaning is real and true. Indeed the classical Christian claim is that the truth of things (and not just texts) is to be found precisely in their referential character and in that to which they refer. To know the personal God is to know God in the manner in which persons are known. The content of a person always has an infinite quality (and this is especially so of God). And that content always has a referential quality as well. Thus, to know Christ is also to know Him as Son, and hence the Son of the Father. “No one knows the Father but by me,” Christ says. For the person of the Father (as is indicated by the name revealed to us) is always referential to the Son (as the Son is to the Father). And this must be said even of human persons. We never know each other exhaustively nor in the crass manner of modern objectivism. For each of us, fearfully and wonderfully made, is also infinitely referential. Thus knowledge of another is perhaps better described as relation or participation. It cannot mean comprehension. The same is true of the text of Scripture. To read the text of Scripture without the constant and abiding sense that there is more here than I can see or understand is not to have read Scripture at all, or at least to have read it badly. St. Antony the Great was once asked by a philosopher where were his books. He replied, “My book, O philosopher, is the world.” St. Paul also sees this aspect of creation: “For since the creation of the world [God’s] invisible attributes are clearly seen, being understood by the things that are made, even His eternal power and Godhead” (Romans 1:20). This capacity of creation, for much of the modern world, has become the opacity of creation. We can see no further than the thing itself. Modern man is in danger of losing his ability to read the references of everything about him. And with that loss comes the diminution of everything, including himself. The world and all that is in it is given to us as icon – not because it has no value in itself – but because the value it has in itself is the gift of God – and this is seen in its iconicity. At Theophany, the waters of the world are revealed to be both Hades and the gate of Paradise. In Christ’s journey within and through the Church, everything is revealed to be such a place. You are my entry into Paradise as clearly as you may also be my entry into Hades. Love alone reveals things for what they are, and transforms them into what they were always intended to be. It is the gift of God. This entry was posted on January 11, 2010 at 5:17 pm and is filed under Orthodox Christianity. You can follow any responses to this entry through the RSS 2.0 feed. You can leave a response, or trackback from your own site. 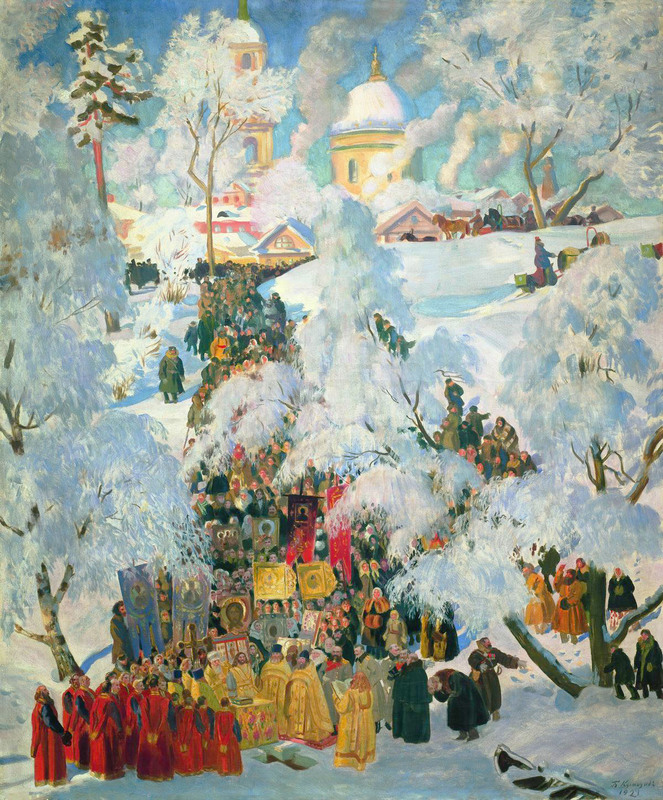 Painting: Boris Kustodiev’s painting “The consecration of water on the Theophany” (1921). There are a variety of terms used by various fathers and little consistency between them. The nature of communication in the ancient world did not make consistency a common thing. What they do have in common, despite a variety of terms, is this sense and belief that there is a meaning behind the text, something to be discerned. Even Theodore of Mopsuestia who was known for a use of the “literal” nonetheless engaged in what he called “theoria” to discern something deeper. I read the fathers. I try to pray in the liturgies of the Church and yet listen. I honor the holy icons. In small ways I try to live what the faith teaches. And in small ways that (and that whom) are referenced gives itself up. But there is no rational method (by definition) by which to reach theoria. It requires patience, humility, prayer and fasting. And, in our modern world, it requires at the very least that there is something there to be discerned. I love Andrew Louth’s essay, “Orthodoxy and Art,” in Living Orthodoxy in the Modern World. And I also like your word, “iconocity.” Have you read The Educating Icon by Anton Vrame? He uses a term I like to contemplate: “iconic living.” As an artist (writer and iconographer) I’m always interested in the intersection of art, theology, and spirituality. Your posts almost always fill that interest for me. Fr. Stephen, have you read Fr. John Behr? His The Way to Nicea might be a good starting point for the Scriptural aspects of your post and relates to Atlas’ question. Additionally, Frances Young’s work on the Alexandian/Antiochene divide would also be relevant. There is no “rational” method because “theoria” is concerned with the Self that is pure perceiving itself and not the ego (self) that receives the perceived as information consciously or unconsciously. Patience, humility, prayer and fasting are indeed required in order to cut the self out – in effect though, they are all sides of the same coin: dettaching; not just from what thoughts are bad, but eventually also from what thoughts are good as the Hesychast fathers insist in the Philokalia. The first thing that goes out of the window are opinions and learned concepts – knowing is more about unlearning than it is about learning. The second, and most difficult, is cutting off emotional attachments that are always harder to drop. It is only when the Perceiver perceives perceiving itself or in Orthodox hesychast parlance when “the (calmed) Nous is centered in the Heart”, that man has become transparent for God to become “The seen and the Seer”, as the Fathers say, within. The problem of western thought and the empirical method, in which all western science is based, is that it never asks the most crucial question ie who does the perceiving in the first place. It is in this way that it denies that objectivity exists in the subjectivity of the human Self that perceives in the first place. Instead it places it in the perceived information. Data never tell a story alone; it is human intuition that discerns the relatiosnhips and patterns in them that creates objectivity, and not hard facts themselves as positivists and modernists would have you believe. Expressing some truth about God inevitably draws us into the act and depths of creation. At the heart of this glorious mystery, the key to the allegory which is God’s own narrative is the Incarnation, still as much a scandal today as it ever was. So overwhelming and revolutionary are it’s ramifications that one can only really take very small, baby steps. Yes, I have read Fr. John Behr’s work. I think of him as a friend and often as a mentor. His The Mystery of Christ is most excellent indeed. I confess that I try not to think too much about it. Better to pray, fast and be patient. Truly this is something I constantly need to be reminded of as I raise my children. It is something I was “taught” by circumstances given to me by God when I was young, but I really appreciate your putting all of this into the words of this article. For someone who confeses not to think too much about it, i have to say that you write frequently, extensively and beautifully about it F. Stephen – to the benefit of us all, nontheless. I also try to do the same (pray, fast and be patient); as the Fathers say: “whatever comes is by the grace of God” and “if you are conscious that you pray you are not praying”. Thank you for your wise and kind advice. “Iconicity” — the referential character of the world we inhabit. And, I might add, the world ‘above’ us. WOW! I think I’m in love with a new word! “I read the fathers. I try to pray in the liturgies of the Church and yet listen. I honor the holy icons. In small ways I try to live what the faith teaches. And in small ways that (and that whom) are referenced gives itself up. i am sorry that my time as a commentator in this blog has come to an end, for personal reasons, some time before your post went on. I’m afraid that i won’t be answering to your questions. its been an interesting time with many good insights from all people that write in the comments and from Father Stephen of course, just its time for me to move on. God travails with fallen man, with the illusions of his referential world and in the iconicity of Scripture; until such time as God’s perfect will is fulfilled in us. Thus, the Feast of Theophany is the fulfillment of Jeremiah’s lament in Chapter 2, verse 13. Or to put it another way, true life is the exchange of gifts that takes place behind the iconostasis, and beyond history. Father Stephen, every once in a while I see things in scripture that I have never seen before but were always there. One good example of this and I think it’s kind of humorus is in Matthew 16 The very first time Peter tries to speak on his own without reference to his brothers he gets himself called satan. What he pronounced in that instance was not particularly infallible! You are correct that it’s “not particularly infallible,” but do keep in mind that Roman Catholics are aware of that passage and have their responses to it. In part, remember that the papacy needs to speak “ex cathedra” for something to be binding. So, anachronistically, they might ask whether Peter was speaking ex cathedra. The point of Vatican One is not whether a pope can make a mistake. Even they admit one can. Nor is it whether a pope might sin, and sin egregiously. Even they admit this can and does happen. The question, for them, comes down to ex cathedra. Don’t misunderstand me. I don’t support Vatican One, but I do want to make sure we don’t take on any straw men because that will come back to haunt us later, when it really counts. I much prefer to look to the follow up to that, where Jesus gives the power to bind and loose (retain or forgive sins) to all the apostles. Same thing happens elsewhere in the Gospels (see Mark and John). I also find Acts 15 to be of importance. Of course, I am reading these passages in accordance with the Tradition and that is the key, too. Sola scriptura won’t solve the issue, either. Glad to learn of your familiarity with Fr. John Behr. I suspect that many who follow the writings of Fr. Andrew Louth are. My familiarity with Louth was preceded by my familiarity with Fr. John Behr. I’ve met Fr. John on a number of occasions (the OCA is often a small world). When I first read him (before meeting him) I was immediately struck by his “feel” for certain aspects of post-modern thought, even though his own work is thoroughly traditional. I was exposed to a heavy dose of post-modern thought while I was doing graduate studies at Duke. I do not in any way claim to be post-modernist, but I was struck then by a certain affinity with pre-modern (Traditional) and post-modern thought. I thought Fr. John did an amazing job of saying things that I had occasionally thought about but not quite articulated. Thus, his work became very important to me in helping me articulate what I only intuited. That’s the work of a very good theologian. I have been equally struck by Louth’s work. He cites a number of people in the West and uses their work (I suspect only because it helps make his point). But his point, I think, is similar to Behr’s. Both Louth and Behr are what happens, I think, when a well-trained scholar of Eastern patristic thought meets the current conversation within the West. The East has much to say. I noticed in reading Louth that I had long held (as early as the late 80’s) some similar thoughts, but had gotten there in another manner (or he has not shared how he got there). My work at Duke, when I began serious Orthodox study, was with the understanding of “iconicity.” I took Orthodox scholars at their word that that the 7th council ultimately summarized all the previous councils. Here I summarize far too briefly, but much of what I articulate was born of that initial understanding and the insights it gives. In sum, I approached Orthodox theology through the lens of the 7th council, and probably still do, at least in the manner in which I find articulable. I have an unpublished thesis from Duke, The Icon as Theology, that I may yet do something with. I had a similar experience when I encountered Behr at seminary. I remember being struck by how what he was saying in class was akin to what I had been noticing in St. Maximos the Confessor and even Theodoret’s commentary on the Psalms (two readings of mine while at Luther Seminary in St. Paul, MN). The OCA is a small world. Perhaps, someday, we shall meet. By “email it to me,” I am asking to read it, if you don’t mind. Well, wait, if it was at Duke, I should be able to access it through a database. I’ll search for it later and see if I can’t. If it’s available through Duke, that would be great. Especially in that I no longer have it in electronic form. Time, software, etc. I just tried to find it on Proquest’s dissertation and thesis database. What’s the citation info? Since you have no electronic copy, that may be that, at least for now. I’m assuming you had to file it with Duke. This was a graduate thesis, right, not an undergrad honors thesis, or was it? Geoffrey Wainwright was its chairman. Ok, had to go to World Cat. It’s not listed anywhere but Duke. I’m assuming it’s a Master’s thesis, then (you mentioned graduate work). Well, I do appreciate the help! My wife arrived at an understanding that I have come to accept. Her statement was that All Myth is True. By that she meant that all of the legends/myths/allegories are based on some common knowledge passed along in the traditions of the various people. So the legends of the Norse of the origins, of deluge, of the final battle of good and evil etc. is describing the same reality as the Scriptures. They just are describing it perhaps not as correctly, certainly mingled with error as well. So in the end Christ is the fulfillment of all things. He fulfills not only the revelation given the Israelites, but the knowledge among the various pagans as well. All paths lead to Christ who is the fulfillment of all things. Its a subtle difference to say all paths lead to Christ than to say all paths lead to salvation. Thus Abraham and the pagan who died without knowing Hebrew scripture/rites or even a pagan who died without ever hearing the Church are all in the end saved the same way, through Christ. How far from orthodoxy is this view ? Tolkien was sympathetic to the same idea. He had some fairly deep conversations with Owen Barfield, one of the Inklings, who had a fairly odd religious/philosophical background. But coming from those conversations, Tolkien said, “If God is mythopoetic, then we must become mythopathic.” His writings were not to produce “allegory” in the sense of Lewis’ Narnia books, but rather to create “myth,” not unlike that of the ancients – but recognizing this unique power and importance of myth, as Barfield had contended. Thus, we rightly have an affinity for the Lord of the Rings, not because he was trying to write a veiled Christian saga, but because he wrote in a mythic manner. Behind myth is the Truth. Tolkien was pure genius.To do what he did is to stand, I think, in a very powerful place and hear with a very deep heart. Didn’t mean to go on at such length, but it’s something I once read and thought about a lot – nearly 35 years ago now. But the quotes are still fresh in my mind. Your wife must be a good woman. God bless her. In my wifes way of thinking the knowledge of creation, the end, even the knowledge of redemption expressed in Genesis “I will create emnity”…. “you will crush his head” was known before scripture was even written by Adam and the descendents. And on through Noah, thus this knowledge was known in the time of Babel and was, at the confounding of languages the knowledge persisted in each group, preserved in myth. So in that sense its not revelation but rather preservation in their rituals and stories. My wife would strongly agree with those who called the pagan myths demonic at the same time she would also say they are based and contain in various degrees truth. Indeed most of the pagan cultures ultimately wound up sacrificing humans. Interestingly my wife doesn’t like Tolkien or Lewis. My wife came to her view primarily from watching hollywood, watching hollywood movies etc. Seeing a pattern, combined with some life experiences. The result of this view is simply that those elements in the Church that are similar to paganism are rather confirmation of how widespread the knowledge was of Christ that even the pagans knew, had an altar to the unknown God etc. And yes she is a good woman, and a smart woman, who thinks in a way entirely differently from me and my rationalist approach. It took me a long time to appreciate her way of knowing things. Evidently the Church in Rome would agree with your wife, if only to a degree. “Not much behind the images” is what the Vatican thinks of Avatar; at least according to it’s official newspaper L’Osservatore Romano. Cameron, Lewis and Tolkien may well have based their characters on historical persons, but this does not mean anything outside their own referential world (and the world of those who would enter into such a place). For instance, in Lord of the Rings, the obvious evils of Saragon are echoed in King Sargon of Assyria, who as leading general in 720 BC routed the Egyptian allied armies at Raphia, assuming control of what was then the western sphere of the civilized world. I have watched the Lord of the Rings trilogy and it is very entertaining. (I was a border at the school where Tolkien purportedly wrote parts of Lord of the Rings in a room appropriately called the Black Room). I don’t know how true this is, but I just thought I’d mention it. It would appear that there is a danger in not going deep enough into things. “Falling into sappiness” I believe, is the term L’Osservatore Romano uses for Cameron’s latest offering. From Praying with the Orthodox Tradition. Tolkien explicitly denied any historical character as providing a basis for his work. I probably take a less literal historical route to similar conclusions – though those routes are doubtless there as well. The writings of Alice Linsley are fascinating in the work within pre-historic semitic peoples, for instance. I was just reading Lewis’ “An Experiment in Criticism” and was struck by his point that until very recently all literature was “fantasy” — meaning that a faithful representation of daily reality was not the goal. And yet most modern readers judge books by how “realistic” or true-to-life they are. Lewis’ point suggested to me that perhaps pre-modern readers were better at accepting that there was a deeper level of meaning in what they read than the merely “realistic” or material. Modern readers, in both literature and Bible reading, may be hampered by their insistence that what they read look just like what they experience. Excessively literalistic Bible interpretation and a knee-jerk rejection of the Harry Potter series, for example, both stem from the same mindset. I blame the Enlightenment! My sense is that Tolkien’s denial would have been a mere legal mechanism (sufficiently “muddying the waters” of the referential world — lest the ears of the Grand Inquisition be unduly excited). Literalism is a very modern phenomenon (in the form that we know it – some mistakenly read it back into any early conversations about literal interpretation). The ancients frequently (particularly the fathers) presumed a deeper meaning in texts. Apocalyptic literature is, more or less, a monument to this belief. Some fathers would read allegory in places we would never dream of using it (and this is not simply confined to the so-called “Alexandrian” school). It has to do with a very different perception of reality than the secular view that dominates everything today, and infiltrates much of our theological thought even within the Church. To believe that reality is iconic to some extent, both things and events, is simply commonplace in the ancient world. Thanks for confirming. And thanks for all these recent posts. They are spiritual (not literal!) bread.